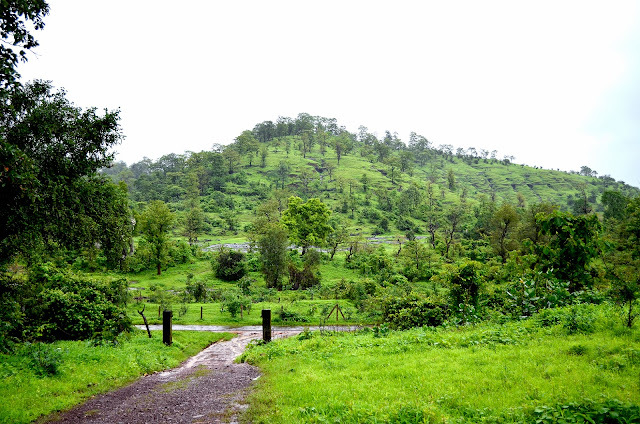 A laid back hamlet, a tiny wild life sanctuary and a gateway to ancient fort located few km away as you climb the off beaten hill path. Time stands still, it takes you back in times to a stage set 2000 years ago. The only sign of modernization is a lone electric cable and a narrow tar of a so called road, both of which terminates at our base camp. This was the story... over a decade back. Thought I will recheck this trek this year. scroll down to know more about the place. 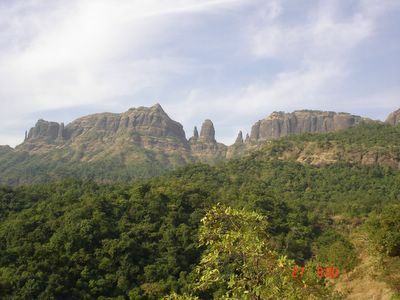 Mahuli Fort. Altitude around 2815 feet above mean sea level. Trek Category: Moderate (3 to 4 hours climb; 2 hours to descend). Location: 5 km off Asangaon railway station, Shahpur region. Reaching there: Asangaon on Mumbai-Nashik highway (91) Kms from Mumbai. 5 kms inside on to the left is the Mahuli village. A temple and a humble home of Mataji Geetabharati is at the base. Temple dormitory and camp area can be reserved. Mataji provides authentic maharashtrian vegeterian food on advance information. Budget for custom trek with small groups. 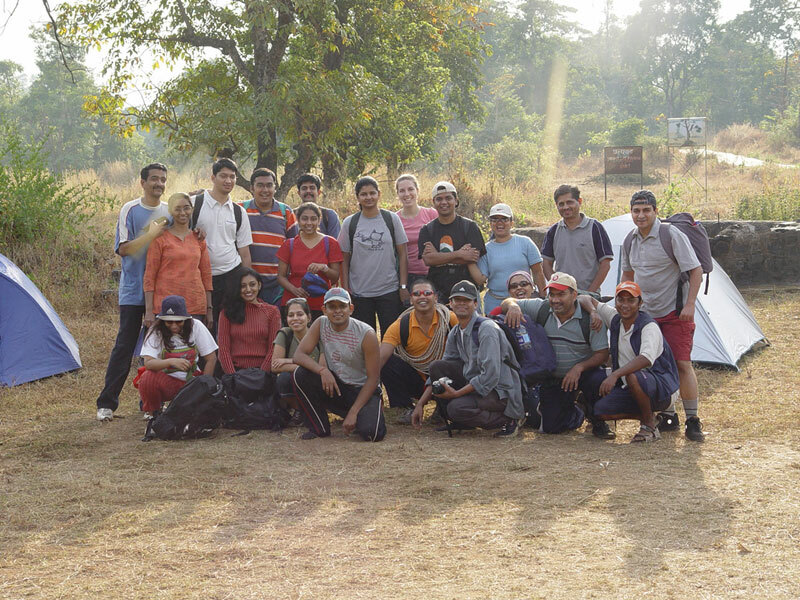 Travel by private transport; Forest entry toll; and Trek Management. Breakfast (One Veg Snack like Dosa or Idli or Vada or Upma or Kanda Poha) and (Tea or Coffee). Evening Tea/Coffee at village. Lunch; Any kind of insurance; Any other meals/menu not mentioned above. 6:00 am Start from Andheri West S. V. Road. 7:30 am Junction of Kalyan and Mumbai - Nashik Highway. History: The creator of this fort is unknown. In 1485 this place came under rule Nijamshahi dynasty. When Shahaji Raje became the secretary of Nijamshahi, Mughals of Delhi tried to end Nijamshahi. In 1635-36, Shahaji Raje transferred himself with Jijabai and Shivaji to Mahuli. When Khan Jaman attacked the fort, Shahaji asked Portuguese for help, who refused and Shahaji surrendered. Shivaji took this fort from Mughals on 8 Jan 1658. In 1661 it was given back and was won again by Shivaji. In treaty of Purandar, in 1665, Marathas lost these forts again. In Feb 1670, Shivaji Maharaj tried to conquer Mahuli, but failed, thanks to an alert Manohardas Gaud, who was the in charge of the fort. Thousand of Marathas were killed. Manohardas Gaud, soon gave up his position and Alveerdi Beg took over. 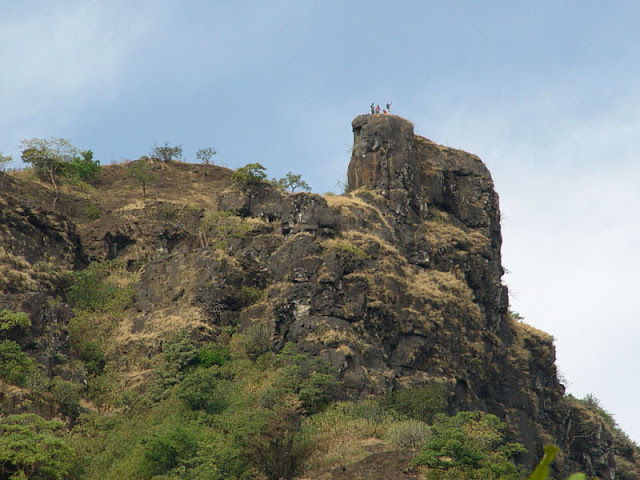 On 16 June 1670, after two months, Moropant Pingle conquered the forts and Mahuli, Bhandargad and Palasgad became part of Swarajya. Till 1817, Shivaji's dynasty owned the fort and later by the Britishers.